Ever since I saw beautiful spiral swirl cookies on Sprinklebakes who has such beautiful photography that it just inspires me to keep on trying. They would make perfect party or wedding favours as they can be made ahead and frozen and you can adapt the flavours and colours to suit any event. After hours of staring at cookie images I dreamt about them which meant I had a soggy with drool pillow and images of swirling colours had caused me to roll the duvet around me leaving the other half with none and shivering (oops). I must have thought about them far too much as the next night I ended up having dream arguments with myself over which colour and flavours to create and I would shout out ‘strawberry’ or ‘blue no pink’ and then silence would fall only to be filled by that baking addict long sigh of contentment. Be warned that these cookies will bring out the sprinkle fetish in you and when the box of sprinkles finally arrived I literally pounced on my poor neighbour with delight as she delivered them to me. I should have waited to open the box when she was gone but the ‘I need sprinkles NOW!’ urge took hold and I started to open the box in a relatively cool (ish) manner. This was until the selotape decided to stick better than a wax strip during a brazilian and then all decorum went out the window. I bit the selotape with my teeth like a hungry caveman, clawed at the box with my talon nails whilst trying to explain to my dear friend (in between breaths) that it was sprinkles inside. She knows me well, so she took a ring side seat and watched me with a smirk as I wrestled with the cardboard caged sprinkle tigers. If you can recognise any of this odd behaviour you need to consult my baking addiction guide here – yes right now! Ahh sprinkles how I love you I could literally look at you for hours. 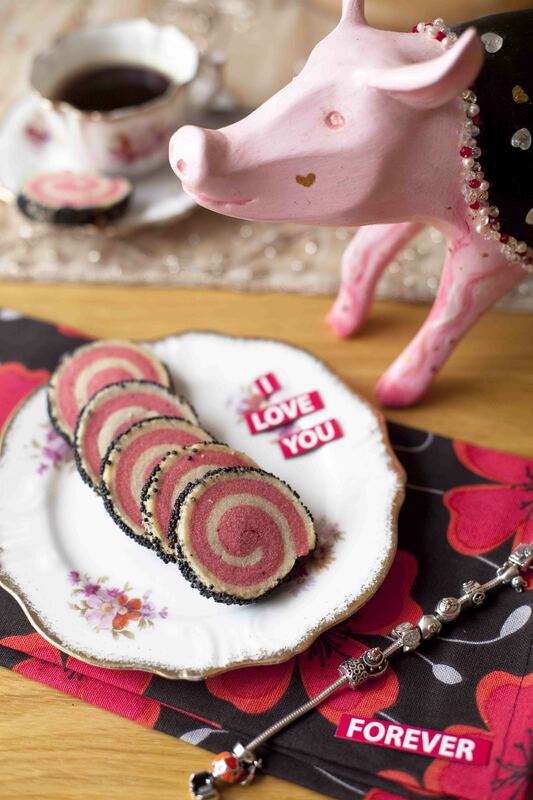 I choose to model the sprinkle spiral cookies on ‘Stupid Cupig’ who is a little Bath pig which I designed and painted for our top table at our Valentine wedding inspired by a play of words from the song ‘Stupid Cupid. I love the Bath Pigs about as much as I love my home City of Bath. The pigs were the focus of a treasure hunt involving life-sized pigs painted by artists, schools and businesses (this was of course before I discovered sprinkles). I spent many an hour hunting piggies with my son trudging behind his maniac Mum just so I could photograph each one in order to name the tables at the wedding after them. How else can you get away with sitting random odd people at a table called Inky Pinky Porky without causing offence! The cookies are cotton candy and vanilla flavour as I wanted something fun and different. They have a melt in the mouth sugar cookie consistency and taste as amazing as they look. I am taking a frozen bath covered in sprinkle butterflies with me on holiday to bake. I will be back to make more of these and I will try to take some of photo’s of the making process as I have my heart set on some pretty packaging and different flavour combinations. 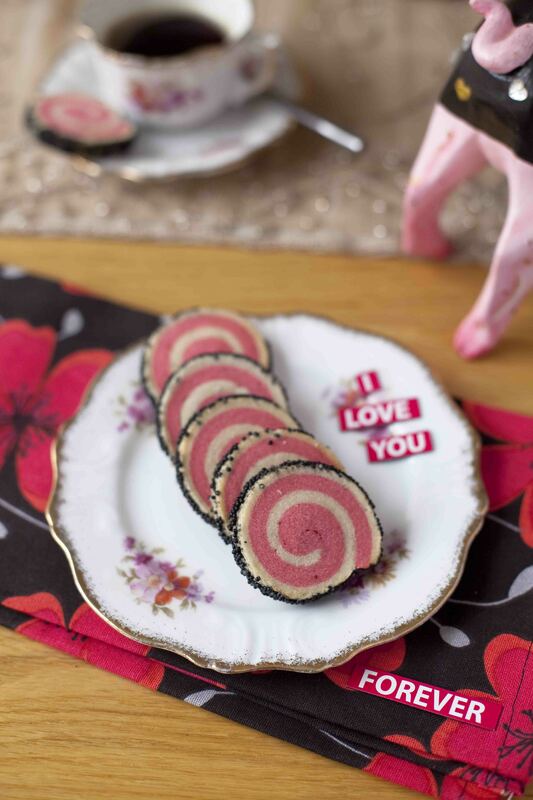 Also I realise as I look at the swirl cookies that they remind me of bacon particularly when accompanied by a pig looking over them – perhaps that’s why she turned her back to them! Makes 3 cookie rolls 1 for now – 2 for later or reduce the recipe. This recipe gives a firm cookie dough that once chilled could be used as a weapon against intruders as well as being firm enough once chilled to get perfect swirls. 4-5 drops of colouring to the butter and sugar mixture (I use Sugarflair as this will not effect the consistency of the dough – which you can buy here) always colour the dough a little bit more than the colour depth you wish it to be as some colour will be lost during baking. Sprinkles – I found smaller ones worked better (non paraleills) – but the choices are endless! Beat in the egg until combined and add the flour and mix on a low-speed until a dough forms. The recipe says to mould the dough into a ball and cover in clingfilm and transfer to the fridge for at least one hour. Repeat above to make the second batch of dough but add flavouring oils and colouring. Line a cookie sheet or flat baking tray with greaseproof paper. Roll out both sets of dough so that each is a large rectangle and 5mm thick (about the size of a pound coin). Place the vanilla dough on on a lined baking tray then place your coloured layer of dough on top – neaten the edges of the dough so both are an equal size by cutting out a rectangle with a knife. Note: If your dough just crumbles and will not roll out I found if I warmed it a little so the dough is pliable and then rolled it out it worked better. Make sure you return it to the fridge for at least an hour or overnight (see below). Now it is time to roll – start the process of by rolling the first layer over the tightly and then roll it up like swiss roll – use the paper to help you get a tight even roll. If the dough splits – pinch it back together and keep going – it will all be fine in the end. Pour your chosen sprinkles to a baking tray (with sides – this is more for me than you!) and roll the cookie in it so that it is covered in sprinkles. Cover your cookie roll in clingfilm and refrigerate for at least one hour – better still leave it over night until firm. At this stage you can also transfer the cookie roll to the freezer for up to one month (I keep them longer and they have been fine) and defrost in the fridge overnight before baking. Bake in the oven for 8 – 12 minutes depending on the size and thickness of your cookie they should not be brown but will just beginning to have a slight golden colour to the outside. I always do a small test batch to see how long to bake them for. This entry was posted in Biscuits, Celebration, Recipes and tagged cookies, cotton candy, favours, parties, pretty, sprinkles, sugar cookies, swirl, vanilla, wedding by Jacqueline Jay. Bookmark the permalink. Thank you if I could I think I would hug one! Thank you Kankou! I promise to make some coffee ones also . the cookies look amazing! btw, i love sprinkles too! Sprinkles are the bakers equivalent of fairy dust! I want to make these! They look beautiful! Give them a try. As long as the cookie dough is well chilled they slice perfectly. Thank you. They were fun to make and cheered me up on a rubbish Monday as you can’t help but smile at them. I love how vibrant the cookies and photos are! Thank you I can’t wait to try other variations . Thanks. My mum brought it for me she is great at shopping ! It’s actually a chocolatiere I never knew one existed til I got one . Thank you. They looked cool like that just ready to be dunked . Thank you ! I just love sprinkles. I love the pictures from your course today looked like great fun! Beautiful!! 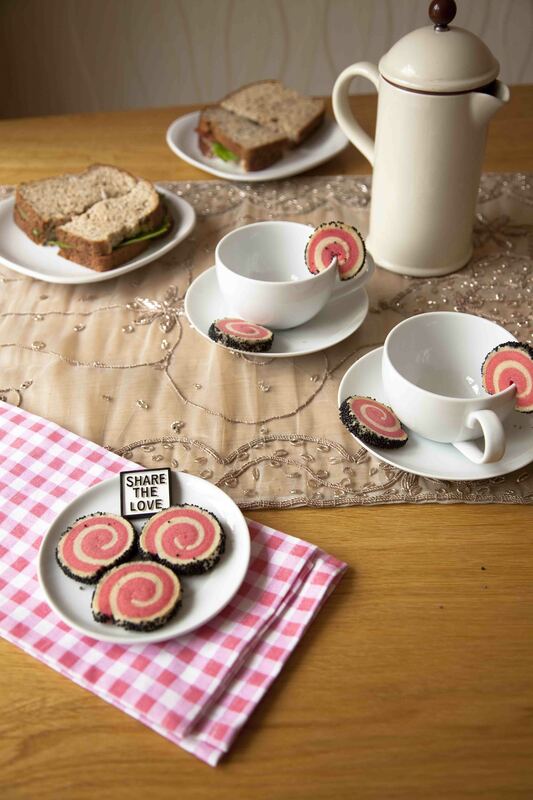 I love the ones on the sided the tea cups – fab idea and beautiful photos!! these are so cute! i love the quirkiness of your photos. Thank you it was yet another random idea of mine! 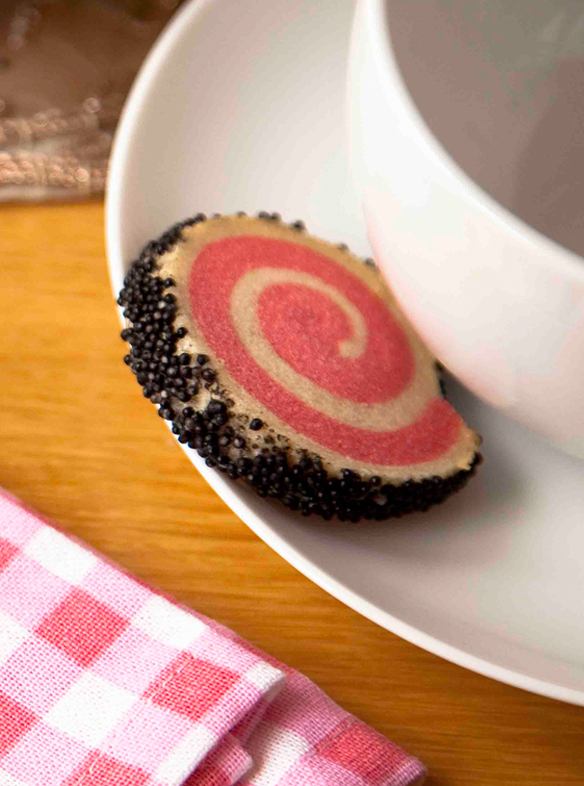 Love these cookies – especially the sprinkles! I’m trying very hard NOT to think of bacon now! 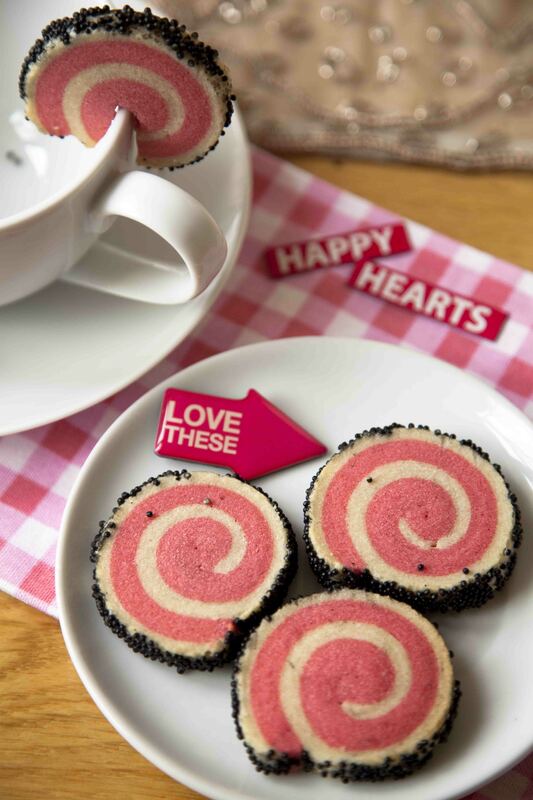 But my goodness me, these look amazing – the swirls are absolutely perfect and your photography is superb. your case? I wouldn’t mind composing a post or elaborating on a number of the subjects you write concerning here. Again, awesome website! 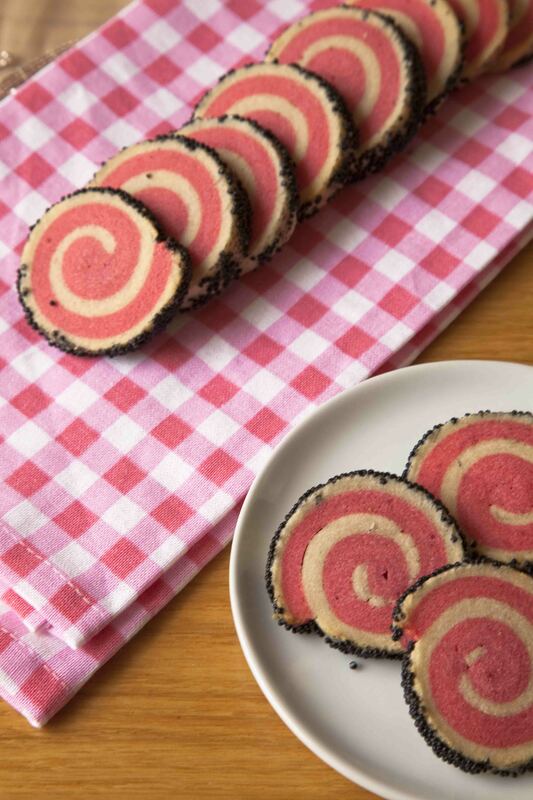 You’ve got to love spiral cookies!! !